Our laminated pocket medical cards fit perfectly in a scrubs or lab coat pocket and provide the most important information on specific topics in a clear and concise manner. These practical, sturdy, easy-to-read reference cards are a must for the medical professional or interested lay person. 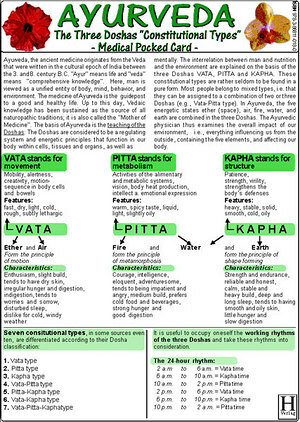 The Ayurveda - The Three Doshas "Constitutional Types" card provides an introduction to and overview of the ancient medicine Ayurveda. It describes the three basic constitution types, their effect on the body's daily rhythmic cycle, and what happens when these constitutions become unbalanced. In addition, it provides advice on proper nutrition, favorable sports activities and other useful tips based on constitution type. Size: 4.1" X 5.8"